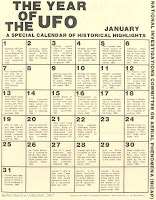 During the 1940s and 1950s magazines catering specifically to readers with an interest in UFOs and various phenomena were certainly available on the newsstands and by subscription (Fate, of course, comes immediately to mind), and if monthly issues promising the truth and nothing but weren't of interest, there was a wide selection of popular periodicals such as Analog, which featured a science fiction theme. Then there were the "men's magazines," predicated on the belief, for their time, that men were masculine hunters and gatherers of the intellect who demanded a reading source printed in testosterone ink. Their proliferation resulted in such dependable, adventure-laden monthlies as Saga, Argosy -- and, most important here, True. True Magazine had a long, gritty history as the top periodical of its kind, but for those interested in UFOs we wish only to offer a brief tribute here for that aspect. True is the magazine that rocked the world in 1950 with an article by Maj. Donald E. Keyhoe (USMC, ret. ), later the head of NICAP, proclaiming that "flying saucers" were real as he astounded readers with dramatic military reports. While True offered a diet of other articles about the strange and unknown over the years, it was Keyhoe's writing on UFOs that easily comes to mind when researchers remember True. In 1965, a year after the Socorro, NM UFO "landing" and a period overflowing with UFO sightings, True Magazine offered yet another blockbuster article by Keyhoe, again highlighting military incidents and evidence that anything we dispatch from a launch pad can easily be shadowed by UFOs. As stated previously, True was not alone on the newsstand with its wide appeal regarding matters of high interest, but this is the title carrying the most weight -- and you can bet that more than one member of Congress sat up and took notice as angry constituents wrote and called them in droves to encourage UFO investigations. True Magazine is gone now, a victim of numerous circumstances like so many other print publications. But for its time, the degree of influence this newsstand king contributed to public opinion about UFOs may still be inestimable. 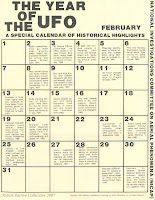 So at last, an ending of sorts as we offer the final monthly calendar from the 1972 NICAP series, "The Year of the UFO." I could mention a number of important events highlighted this month, but I'll leave the research up to you, the reader, as you click the page for a larger image -- and, by all means, go to the NICAP link and visit the NICAP site search engine for specific details of major incidents. Oh, there is one little thing to add today. . .
December, as shown, also marks the month in 1960 when the Brookings Institution "think tank" released a report intended to explore the consequences, when and if we earth folk meet extraterrestrials for the first time. Curiously, the report claims it will be the scientists, not the common man or woman on the street, who may be affected most adversely. Or, to quote a familiar line from a motion picture, if you're a scientist pretty much set in your ways, engrossed in the dictates of your field with little choice to deviate from that which you've always believed is rock-solid, Brookings apparently says: You can't handle the truth. Who would have thought? 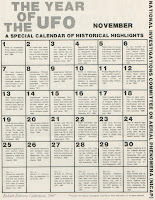 The year 1957 figures prominently in November's calendar of the best UFO cases on record, as Texas and New Mexico experienced highly bizarre activity that remains, like most of the older reports offered here, unexplained 35 years after NICAP distributed "The Year of the UFO" to its membership. My previous blog entry highlights an aspect of the November 9, 1965 Northeastern U.S. power blackout noted here, and the month is also significant for the famous Lake Superior incident in 1953, where radar seemed to show the merger of a huge UFO with a military aircraft and a two-man crew sent to investigate its presence. Recent news reports and underwater photos indicating that the missing airmen's craft may have been located are now considered a probable hoax, based upon investigations by MUFON (Mutual UFO Network) and others. Before I post NICAP's "The Year of the UFO" for November in a day or two, let's take a few lines to revisit an incident you'll find listed in the calendar's November 9 box. The fact that you're reading this means in a few seconds you'll be "one up" on people, news accounts, books, magazines and other means of communication regarding what is commonly known as "The Great Northeast Power Blackout" of November 9, 1965. Many sources associate this monumental historical event that deprived Northeastern U.S. states of electricity for several hours with UFO activity (perplexing questions still remain about the cause) -- and as a researcher who was indeed involved in checking reports in the key Central New York area, seemingly a hot spot of UFO activity on that evening, I concur that something mighty strange was going on there and in other areas of the Northeastern U.S. at the time (see the late Dr. James E. McDonald's report during Congressional hearings, for example, available online). As recently as a year or so ago, in fact, I spoke with a Syracuse woman, still concerned 40 years later by a strange light witnessed from her window during the blackout. Nevertheless, one witness often mentioned in reference to UFOs observed during the blackout is former Syracuse deputy aviation commissioner Robert C. Walsh, a pilot who saw something himself while flying locally that evening. His experience was reported by the Syracuse Herald-Journal (I spent some time one afternoon with one of their top reporters, who kindly shared information with me) and other media. As a NICAP member at that time, my interest involved encouraging witnesses to fill out detailed NICAP UFO report forms. 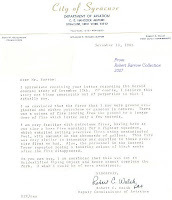 However, unknown to many investigators and members of the media to this day, who persist in quoting Walsh as seeing UFO activity, this ultimately was not his story. Now, I don't know whether there were other factors in his report, or whether he changed his mind for reasons unknown, because from what I recall of initial reports he saw a strange sight. All I can really do here is respect his integrity, assume I have the truth and final word on the incident from him, and offer the letter he sent me in which he declined to complete a NICAP report form because he determined, from his aspect, no UFO involvement. Aside from this, keep in mind that the skies were awash with reported UFO activity all over the Northeastern U.S. on the evening of November 9, 1965, and 1965 was also a year sprinkled with reports across the U.S. of smaller power blackouts associated with UFOs and UFOs seen near or over power lines. As mentioned previously, author John G. Fuller's nonfiction book chronicling the Incident at Exeter (New Hampshire) is a great reference source about 1965, and if you haven't read it, well, it might scare the pants off you when you do. One final curious note: In the weeks following the Northeast blackout, I spoke with a power company official intent upon anonymously sharing some apparently important information with me, possibly related to UFOs. The deal was that he either would or would not get back to me with the story. I never heard from him again. 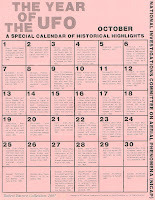 Pay special attention to French UFO cases of the early fifties, highlighted abundantly throughout October's calendar. While this month showcases several other incredible reports, some involving physical evidence and sounds, France's UFO wave served for many researchers to prove that the UFO mystery has international roots. No country is exempt and, taken as a whole, the global UFO phenomenon demonstrates remarkable similarities everywhere. John G. Fuller's essential book, Incident at Exeter, was sired by dramatic events in Exeter, New Hampshire in 1965, highlighted here on the September calendar. September 19, 1961 commemorates the Barney and Betty Hill alleged abduction incident. Also noted is the "first landing case" documented during the French UFO wave of 1954, a period noted for reports of UFO occupants, electromagnetic and physiologic effects. Pretoria, South Africa, contributed an incredible UFO evidence case in 1965 when police officers witnessed a disc-shaped object taking off from a road with a blazing exit, igniting and burning a hole in the road surface. Significant UFO memorabilia such as the "Operation Mainbrace" events (NATO pilots encounter UFOs, and the second consecutive night of sightings is mentioned here) and the Fort Monmouth, NJ incident (1951) are recorded here. By September of 1967, the troubling phenomenon of animal mutilations (cattle, horses, etc.) began to make national headlines. Whatever one thinks about 1952's (UFO-related?) "Flatwoods Monster" of West Virginia, the subject of a recent book and possibly a future motion picture, this peculiar story is noted on September 12. Without referencing almost every day of each month in these little blurbs I write to accompany "Year of the UFO" entries, it's impossible to emphasize the strangeness and rock-solid importance of the UFO phenomenon. The reader really has to click on and enlarge these monthly pages to review and regard as a whole the undeniable truth that UFOs are real and have the ability to influence our lives in ways far removed from current scientific knowledge. If the reports highlighted in August don't make that point, what would? Lakenheath, England, in a famous series of events, was the scene of multiple radar and visual UFO incidents in 1956 (well-reported in the literature). In 1950, Nicholas Mariana miraculously retrieved his camera in time to film in color two, still officially unexplained, UFOs over Great Falls, Montana before they disappeared. In 1959 a UFO passing above a Brazilian power station somehow caused automatic keys to turn off, and upon departure they turned on again. Ten years previously in 1949, astronomer and discoverer of the planet (or not a planet, depending on whose science one currently believes) Pluto, Clyde Tombaugh, and his family watched six rectangles slowly traverse the sky. Tombaugh's name always seems to surface whenever the question arises, have scientists seen UFOs -- probably because he openly shared the mystery of the event in written reports and drawings. When this writer reviewed an mp3 disc release from Faded Discs (see link in margin) a few months ago, featuring an astronomer describing his UFO sighting of just hours before, the poor fellow was literally on the verge because he had never "believed" in these things previously -- and now he was confronted with a sighting that apparently violated every scientific rule he thought he knew. Project Blue Book chief Capt. Edward J. Ruppelt made a most intriguing statement in 1953 when he revealed that a gun camera's UFO photo taken while a jet pursued a UFO over Ellsworth Air Force Base showed the "best unknown." 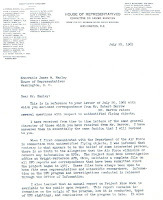 Also in 1953, in conjunction with the Robertson Panel (CIA) report on UFOs, Air Force Regulation 200-2 was put into effect, detailing how Air Force personnel should report UFOs and, especially important, that USAF personnel would be severely restricted in revealing UFO information to the public. Not to belabor the obvious by now, but new readers should know that in most cases one can go to nicap.org (link in margin) and consult its excellent search engine for the best information on the cases highlighted in these monthly calendars. Taken as a 12-month collection, NICAP's calendar months from 1972 instantly provide an historical oversight to a phenomenon which should not be ignored by anybody interested in the pursuit of science and truth. The skeptics are wrong to wallow in their skepticism just for skepticism's sake, and debunkers are just plain wrong, maybe dangerously wrong, as they serve as a stone-wall impediment to open and inquiring minds. 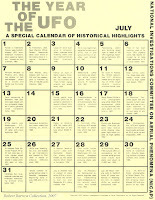 July throughout UFO history of the forties, fifties and sixties overflows with important events. Small "humanoids" are observed in France in 1965, a pilot and co-pilot over Walesville, NY eject from their craft in 1954 during pursuit of a UFO as a sensation of intolerable heat overwhelms them, and beginning in July, 1946 "ghost rockets" invade Swedish skies and continue until well into 1947. In 1962 an X-15 pilot is accompanied by a UFO for five seconds before it departs quickly. 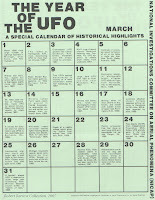 This is also the famous month when Washington, D.C. remained on alert for UFOs in 1952, as multiple objects were observed visually, tracked via radar and pursued by military pilots -- and even as government officials attempted to assure an anxious public that all was well, all vestiges of rare openness with the press and public about reported UFO activity were about to disappear forever (the 1953 CIA-convened "Robertson Panel" assured, we might say, new threads for the curtain of censorship). Navy chief photographer Delbert Newhouse filmed an incredible group of somethings over Tremonton, Utah, in July of 1952, objects still unexplained to this day (sadly, Mr. Newhouse died a few months ago, just, literally, hours before a TV documentary crew reached him for a planned interview). Do scientists see UFOs? July's notations will help you say the word, and the word is clearly yes. Whatever exploded over the Tunguska region of Siberia in 1908, it happened during June, a month also notable for the famous Father Gill UFO experience in New Guinea and a UFO sighting by military personnel in Vietnam. Note, too, that UFO occupant cases continued to grasp the attention of investigators, and during the mid-sixties mysterious power failures in association with UFOs became common. May is a month of contrasts in terms of media and scientific treatment of the UFO subject. On May 7, 1952 Life Magazine stormed the nation's newsstands with an article boldly suggesting "There is a Case for Interplanetary Saucers." Based on interviews with scientists, government officials and highly reputable UFO witnesses, this landmark piece left little doubt that flying saucers may have an interplanetary source. Yet, 16 years later it was left up to Look Magazine of May 14, 1968 to alert readers in a bombshell report by writer John G. Fuller that the government-financed UFO "study" at the University of Colorado was being mismanaged and hell-bent upon publicly reaching a negative conclusion about the UFO phenomenon, no matter what the findings. Entitled "Flying Saucer Fiasco," the article revealed a confidential memo and other internal information casting tons of doubt upon the Colorado project's integrity. May 11, 1950 gave us the famous UFO photos snapped by Paul Trent of McMinnville, OR, perhaps still among the most respected still photos ever taken, based upon witness veracity and other factors. You'll also notice a sprinkling of reports in the May calendar revealing not only radar and photographic evidence, but also electromagnetic effects. For example, on May 4, 1968 a red light buzzed a ship off the coast of Nova Scotia, and intense heat was reported in association with the experience. On May 9, 1956, the United Artists documentary motion picture, "U.F.O." was released and remains one of most important -- if rather obscure now -- movies ever made about UFOs. Please be sure to read my articles about the film at NICAP.org, easily found by typing my name into the NICAP site search engine. While several interesting reports are highlighted in the April calendar, the April 8, 1956 reference to an airliner over Schenectady, NY, also known as the Raymond Ryan case, is very important. Despite flying passengers on a commercial airliner, Capt. Ryan and First Officer William Neff were apparently instructed by authorities to pursue a UFO -- a clear violation of federal and air safety rules, no matter how one looks at it.. Though the facts of this astonishing case became muddied quickly by those same authorities, NICAP had the pilot's admission recorded on tape and filed safely away. If you aren't familiar with this case, enter the name Raymond Ryan in the NICAP search engine (link to NICAP is shown above on this page) and read several intriguing accounts right at your fingertips. In light of the previous "NICAP'S Year of the UFO" post where I referenced the Michigan "marsh gas" furor, it is worth remembering that Gerald Ford, then a Michigan congressman and House minority leader, demanded a government UFO inquiry. His persistence eventually led to the infamous University of Colorado UFO project headed up by the late Dr. Edward U. Condon. When Look Magazine eventually published a disturbing article by author John G. Fuller exposing dishonesty and an internal memo stating that the "study" should have a negative result, no matter the evidence, Ford expressed his anger. Here's a letter I received after writing him about the Look Magazine revelations. How interesting that, once people such as Ford and Jimmy Carter become President of the U.S., they are never again vocal about UFOs -- as they were prior to assuming high office. The month of March echoes across the archives of UFO history particularly because March of 1966 gave us the famous "swamp gas" sightings near Dexter, Michigan. However, as anybody familiar with the work of UFO researcher Wendy Connors should know, Dr. J. Allen Hynek never attributed some of the sightings to swamp gas -- his words were marsh gas. Connors (see a link above to her Faded Discs project) has the audio recording to prove it and has played the words on Errol Bruce-Knapp's "Strange Days...Indeed!" radio program (see Virtually Strange Network link above). 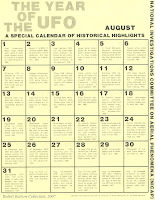 This month in 1966 also showered the USA with a wave of interesting UFO reports from Oklahoma, Michigan, New Hampshire and other states, aptly noted in the calendar. Other March incidents mentioned here from various years involve objects following cars, tracked on radar and photographed by apparently solid witnesses. February's listings spotlight more documented UFO incidents from the NICAP files, as well as a prelude to the Colorado UFO project. 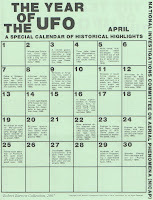 I'm not certain, but the organization NICAP was probably the first to generate a monthy calendar format spotlighting important events in UFO history. 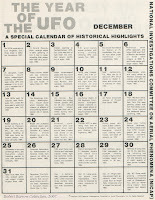 In 1972 every NICAP member received with each bimonthly issue of The UFO Investigator a fold-in page containing a month of UFO history on each side (January on one side and February on the reverse, for example). Page colors changed with each mailing. During June, I intend to post all 12 months of "The Year of the UFO," the obscure, yet captivating, NICAP feature, and even after 35 years of storage these old copies are in good condition for scanning. January, as you can see, boasts both familiar and lesser known UFO memorabilia. For instance, Capt. Thomas Mantell died in January during his pursuit of something (UFO? Balloon? ), in 1950 True Magazine published an important article by Maj. Donald E. Keyhoe (USMC, ret. ), the famous Wallops Island UFO incident occurred in 1965 and, if only we could forget, the "Condon Report" -- the government-financed UFO study tainted by scandal -- saw release in January of 1969. One of the best features of these monthlies, aside from marking important occasions, is that in many cases the reader can go to the NICAP web site (see link list above) search engine, or other sources, to retrieve detailed information just by typing in key words and dates. Continue to check back, as months may not be posted on consecutive days here, though the series will be completed by June's end. A pleasure it is, yes, to add a worthwhile link today for the J. Allen Hynek Center for UFO Studies. Created by the late Dr. J. Allen Hynek, whose credentials as a professional astronomer and former U.S. Air Force chief consultant on UFOs are legend, CUFOS has continued to play an important role in UFO investigations and research since its inception in 1973. Dr. Mark Rodeghier currently heads up CUFOS as Dr. Hynek's successor, and the organization currently publishes The International UFO Reporter, The Journal of UFO Studies and engages regularly in other publishing and investigative projects. "The Center for UFO Studies (CUFOS)," states organizational literature, "is an international group of scientists, academics, investigators, and volunteers dedicated to the continuing examination and analysis of the UFO phenomenon. Our purpose is to promote serious scientific interest in UFOs and to serve as an archive for reports, documents, and publications about the UFO phenomenon." 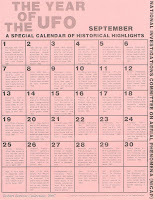 AN IMPORTANT REASON WHY I mention this compact disc is because it also contains NICAP's 1972 series, "The Year of the UFO," a monthly calendar spotlighting the dates of important UFO cases. You'll be interested to know that in a day or two this blog will begin posting all 12 pages from "The Year of the UFO" for my readers. If you care about the older, impressive UFO events and various days important to UFO history, please be sure to check out these original gems, which I believe accompanied The UFO Investigator issues on a bimonthly mail-out basis. I'm pretty sure you'll want to download them, as the scans look quite good -- though perhaps not as pristine as I'm sure they are in the NICAP compact disc. Side Note: I had the honor of briefly meeting Dr. Hynek when he spoke at Onondaga Community College (Syracuse, NY) on April 9, 1980, invited to speak via the monumental efforts of a Syracuse amateur astronomer who also happened to be a UFO researcher. What a hoot it turned out to be as Hynek not only discussed UFOs and science, but also took a few moments to criticize the local astronomical society about its ignorance and debunking about UFO evidence. This, from a scientist who slowly changed from UFO skeptic to accepting of UFOs as a legitimate and disturbing scientific mystery -- and thus his impetus for the creation of the Center for UFO Studies. In the meantime, welcome CUFOS, and thanks to Mark Rodeghier for his guidance as we add the essential link above. In his time, there was nobody like L. Mendel Rivers, Chairman of the Armed Services Committee, to put his critics in their place. 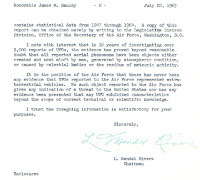 Via Congressman James Hanley, he certainly set me straight in this July, 1965 letter, parroting the Air Force position on UFOs. There's nothing particularly striking about this letter except it demonstrates that, at least publicly, official UFO commentary hasn't changed in over 40 years. How sad. How outrageous. How refreshing, those times when members of the U.S. media grit their teeth and discover they actually can report about UFOs without throwing in some lame joke at the end that literally screams out to the audience, look, we all know this is a joke and has no place in the news, but it was out there, so we were forced to include it. In 1965 Argentina reported significant UFO activity, and this letter from a TV news department clarifies one of the more familiar incidents making headlines. WSYR-TV is now WSTM, and another Syracuse TV station adopted the WSYR name in recent years. 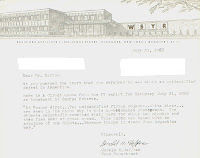 This letter comes from the original WSYR-TV. Congressman Jim Hanley was unquestionably one of the best House representatives Central NY ever hosted, and the James M. Hanley Federal Building in Syracuse honors his reputation. 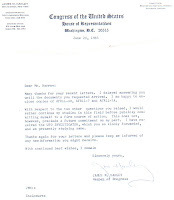 In the sixties and seventies I inundated his D.C. and Syracuse offices with letters regarding the UFO subject, and whether I had concerns about the topic in general or needed government documents relating in large or small ways to UFOs, he kindly fulfilled my requests as often as possible, even when "butting heads" with military or government officials to gain information. The June, 1965 letter shown here is typical, and in this case he obtained several Air Force regulations for me. He also acknowledged receiving a copy of NICAP's UFO Investigator I had sent to keep him informed. 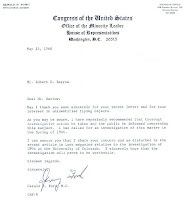 Like many members of both the House and Senate, he was intrigued by the UFO evidence, but maintained a reluctance to comment or take action publicly. Nevertheless, I deeply appreciated the late Mr. Hanley's assistance over the years and I'll be putting more of his letters on display in months to come. 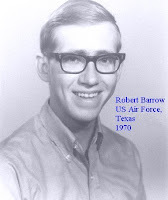 For those who haven't yet checked my other blog, concerning my four Air Force years from 1968-72, there's a link on this page in the link list. I posted a 1970 photo of myself over there a few weeks ago and thought I would use this golden opportunity to again plaster my face on a blog. Have I changed much? Yep. Maybe I'll post something more recent eventually. For now, here's the oldie.